Tootsie Time: Bloggers and RMS'ers THIS ONE'S FOR YOU! Bloggers and RMS'ers THIS ONE'S FOR YOU! AHEM! (clearing of the throat) (little sip of water, deep breath, and grab my tissue....) AHEM! I have made so many friends online in the last few months. Many of these friendships began on the Rate My Space web site, and have moved over to personal emails and blog comments. I have grown very attached to so many of you, and miss the small glimpses into each of your lives when you are away. As many of you know, I have had one of the worst summers of my entire life this year, and it has been a saving grace to me to have had you all in my corner. Without your support and advice, unconditional, loyal friendship, and kind words, I do believe that this would have been far more difficult to deal with. For that I want once again to say thank you. We live all over the place. I am one of the only Canadians in this little community, and will probably never get the privelage to meet most of you face to face, but the closeness I feel to so many of you is more than I have with many of my face to face friends. 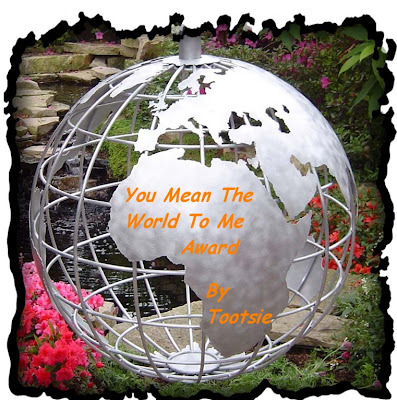 If your name is on my blog list..this award is for you. If you don't have a blog, but you are are one of my RMS friends...this award is also for you. (You know who you are.) You have each touched my life in different ways, but all of you have left a positive mark on my heart! Thanks again for just being you! Please let me know when you collect your award!